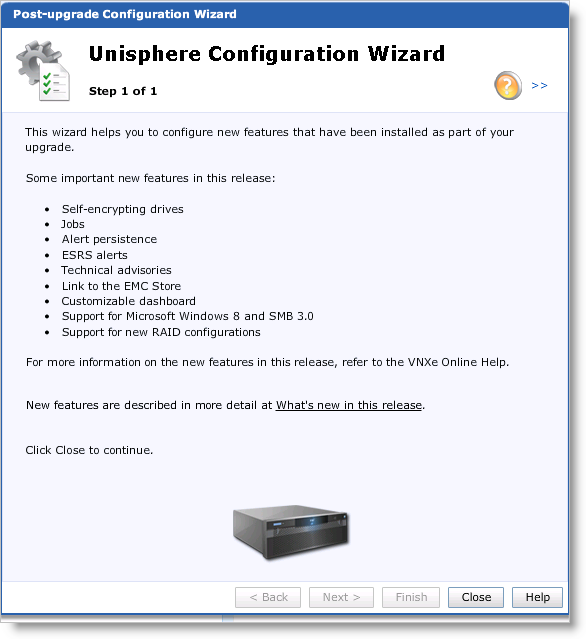 VNXe Operating Environment (MR4 – 2.4.0.20932). You can now purchase a VNXe system that supports Data at Rest Encryption through Self-Encrypting Drives (SEDs). This feature provides security for stored data when physical control of the drives is lost. All data on a SED is encrypted and requires a valid authentication key for access. The SED encryption/decryption process is transparent and automatic, with no noticeable performance impact. Some of the long running operations are now automatically set as jobs that run asynchronously in the background. This enables you to take control and continue working with the user interface while the job completes. A notification, similar to the alerts feature, appears when a job completes. At any given point, you can view the list of running, completed, or failed jobs by clicking the Jobs icon at the bottom of the screen. In earlier versions of VNXe, alerts were lost when the system failed over or restarted. Alerts now persist across system failovers and restarts. VNXe now creates alerts when EMC Secure Remote Support (ESRS) is in an unhealthy state. Unisphere now includes a Technical Advisories page that enables you to view up-to-date, real time information, and advisories specific to your system from the knowledge base available on the EMC Online Support website. Unisphere now includes a link to the new EMC Store website that offers you the ability to purchase additional storage, I/O modules, and software products quickly and easily. You can access the EMC Store website from the Support page in Unisphere and request a quote for disk drives, software, and other relevant components. Note: The EMC Store website will be available in 2013. You can now promote existing snapshots of VMware NFS-based datastores to snapshots that can be mounted with read-write access. Such promoted snapshots are also referred to as writable snapshots. Once promoted, a mount point (export path) is exposed in such a manner that the hosts configured for the storage resource can also access the snapshot through the mount point. The System Replications page and the Replication Details page include the Pause and Resume buttons that enable you to pause and resume a replication session. At any given point in time, only one of the buttons appears on screen based on the state of the replication. You can now reverse the direction of a replication by failing over or switching over the session, and then clicking the Resume button in the System Replication page on the destination storage resource. VNXe now provides support for Microsoft Windows 8 and Server Message Block (SMB) 3.0 protocol. This includes support for continuous availability and CIFS encryption for hosts capable of using CIFS with SMB 3.0. Continuous availability includes several features, such as multi-network path access for the same session, synchronous writes to the backend, and enables applications to be less impacted during a CIFS server failure or recovery of application. CIFS encryption provides security to the data in-flight between the array and host. Other features such as larger IO size, offload copy, parallel IO on same session, and directory leasing provide improvements to performance and user experience. With continuous availability enabled, you can achieve a transparent server failover for implementations where the failover time is no longer than the application timeout. In such implementations, hosts can continue to access a CIFS resource without the loss of a CIFS session state, following a failover event. The Unisphere dashboard is now customizable. You can now set up multiple tabs and multiple widgets in each tab. These widgets can contain the information you want to monitor, such as system health, capacity, and so on, or tasks that you perform frequently. VNXe now supports the use of VMware Site Recovery Manager (SRM) for VMware NFS datastores. This is achieved through the use of a Storage Replication Adapter (SRA) client introduced for VNXe systems. This will now enable you to view NFS replication statistics, create or manage writable snapshots for NFS-based datastores, and include additional options in the user interface for the replicated NFS datastores. Note: The SRA client will be available once the VMware certification testing is completed.